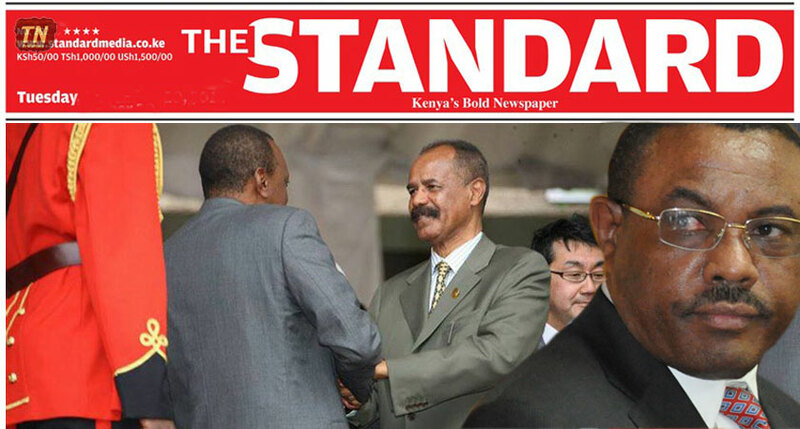 Is Ethiopia in cahoots with Kenyan private media to drive a wedge between Eritrea and Kenya? The repeated distorted reports on Eritrea’s position and reputation on Kenyan media could be the work of Ethiopia. Last week the internet was set ablaze due to a viral story published by a Kenyan based media group The Standard regarding Eritrean government decree proclaiming polygamy legal. The story was proven not only to be false but various African and international media outlets were duped. It is not surprising though as the Kenyan newspaper has a history of reporting inaccurate accounts as few weeks prior that there was another false story on mini skirt ban by Tanzania government. What is the connection and motives for Eritrea and Tanzania to be targeted with distorted untrue reports as these? Take the case of one story reported by The Standard in late April of 2015 that insinuated Eritrea was to blame for President Uhuru Kenyatta canceling the trip to the US after his flight was forced to turn back en route to Dubai. The story was able to gain regional traction but did not catch international media attention compared to last weeks false polygamy story. “Our attention has been drawn to reporting in the print and electronic of a meeting between His Excellency the President Mwai Kibaki and the Ambassador of the State of Eritrea to Kenya, H.E. Beyene Russom, on 29th October, 2012 at Harambee House. It was reported that His Excellency President Mwai Kibaki had informed the Ambassador of Eritrea, Kenya was willing to assist Eritrea rejoin the Inter-governmental Authority on Development (IGAD) if the State of Eritrea ceased to propagate its extremist agenda within the region. The Ministry of Foreign Affairs, which was represented at the meeting and indeed was recording the Minutes, whishes to categorically state that no such statement was made at the meeting. Instead, His Excellency the President asked the Ambassador of the State of Eritrea to reassure his President, His Excellency President Isaias Afwerki of Kenya’s desire to maintain warm, friendly and forthright relations with the State of Eritrea and welcomed Eritrea’s return to IGAD. We all upon the media houses that mispresented what was said at the meeting to retract by printing or broadcasting what actually transpired at the meeting as clarified above. Who are the anonymous “informed sources” that keep feeding distorted reports over the years that paint a perception of “bad blood” and a diplomatic row between Eritrea and Kenya? Is it plausible that the Ethiopian regime has direct opening to influence and shape Kenya private media by offering a financial incentive to media owners and senior editors? They [Eritrea] go to pains now to tell you ‘look we are your brothers and we are your friends why you want to make an enemy out of us’. Because Eritrea has a war with Ethiopia, an issue that has gone to international court and determined by the international court which actually said is illegally occupying Eritrea land … they [Ethiopia] are the aggressors. We keep calling the Eritreans terrorist supporters … It is increasingly going to dawn on them we are doing this thing because somebody else is managing our foreign policy. From 2007 to 2012 relations between Eritrea and Kenya were frosty due to influences of the Ethiopian regime and Washington. The key development that shifted and increase tension was after Washington subsequently encouraged Ethiopian to invade Somalia in late 2006 (READ: WikiLeaks Reveals U.S. Twisted Ethiopia’s Arm to Invade Somalia). “… The Government of Eritrea officially notifies with regret, to the current chair of the IGAD Assembly of Heads of State and Government that Eritrea has temporarily suspended its membership in the Intergovernmental Authority on Development (IGAD) effective 21st April 2007. The Government of the State of Eritrea took this difficult move in reaction to a number of resolutions passed pertaining to the worsening situation in Somalia, in the name of IGAD. The Eritrean Government is convinced that such resolutions go contrary to the core principles of IGAD in the promotion of peace and security in the region. Moreover, the resolutions taken recently are contrary to the previous IGAD and Security Council resolutions, in particular, the non-involvement of frontline countries in Somalia. Eritrea does not want to be part of this historical blunder, which is the main cause of anguish, destruction of property and loss of life of many innocent Somalis. Following Eritrea decisions to suspend its membership, the Ethiopian regime held IGAD chairmanship captive (READ: IGAD: A Regional Organization Or A Forum Run By Ethiopia?). After 2007 with Eritrea out of IGAD Washington had more room to maneuver and place sanctions on Eritrea for facilitating a peace conference. The 2007 Somalia conference hosted in Eritrea was independent of Washington and was politically inclusive platform similar to the successfully East Sudan peace deal signed in Asmara which ended the armed conflict. During the conference, Eritrea brought together various lawmakers, civil society, business class and with representation from the Somali diaspora which could have led to reconciliation and possibly ended in an independent Somalia government owned by Somali unlike now in which Somalia is under Ethiopian colonial rule. Eritrea in 2007 even hosted Sharif Sheikh Ahmed before he become president of Somalia and double crossed Eritrea by joining Ethiopian regime as a lackey that antagonize Eritrea willingly. In fact, Ethiopian regime hijacking IGAD was a strategic win for Washington to give the impression it was directly an African initiative that led up to supporting its concocted sanctions on Eritrea. Undeniably the Ethiopian regime is a destabilizing force in the Horn of Africa acting as a proxy for the west. For instance, in may of 2015 heavily armed Ethiopian soldiers entered Kenyan border without proper notification or permission from Kenyan government and again few months later Ethiopian soldiers invaded Kenya and killed three police officers. Kenya’s government strikingly respond quietly behind the scene to Ethiopian regime routine illegal incursion and direct violation of Kenyan territorial integrity. Bilateral relations between Kenya and Eritrea have improved under President Uhuru Kenyatta compared to those frosty years under his predecessor. Eritrea and Kenya currently continue to have fruitful diplomacy and growing link in the educational field. In 2013, President Uhuru invited President Afwerki to attend Kenya’s 50th independence jubilee celebration and the president was warmly received. After the president of Eritrea visit, there was greater effort in exchanging of higher learning opportunities between the two sisterly nations. In 2013 six Ph.D. students were sent to Kenya and as of 2015 Eritrea has hired 35 expatriate lecturers in institutions of higher education. Finally, it can be concluded that there is a possibility to suspect Ethiopian regime could be behind Kenyan private media attempts to drive a wedge between the government of Eritrea and Kenya. Washington through its Ethiopian proxy still continues to enact a failed policy of containing and isolating Eritrea from the region and international community. Therefore distorting Eritrea’s position and reputation in the African and international media is part of that isolation drive.